I graduated from law school half a decade ago, after 3 years of torts, contracts, and the Socratic Method. So when it comes to getting the best backpacks for law school, I am very aware of what an important choice this is. In this post, I’ll break down what to look for in a law school backpack and my top choices for the best bag for law school. If you’re in a hurry, you can click here to check out my top pick, the North Face Borealis. Ready to get geared up with the law school essentials? 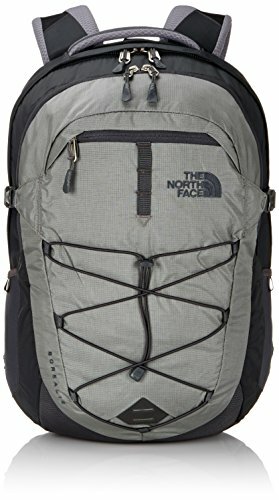 The most beloved backpack brand among law students I surveyed, The North Face has a real winner in its Borealis pack. Let’s put aside the number of striking color schemes in their modern redesign of this classic North Face backpack for now. It’s all about the benefits for a law student. As for styling, there’s a ton of different options. However, my favorite is going to be something in a light or medium gray. They’ve got men’s and women’s versions, in case that’s something that matters. The only difference seems to be the colors that are available. In all, you can’t go wrong with this great lawyer backpack for your classes. Ready to get one for yourself? Click here to check out the latest prices and available styles. That’s what they tell you in law school. You never accept one side as the correct answer. So let’s get an alternative law school backpack. Osprey was the 2nd most popular choice among the students I surveyed. Their Nebula model is a perfect fit for a law school backpack. It’s a bit bigger inside than the Borealis, so it’s even better if you expect to carry more. The laptop sleeve is padded, and it hangs inside the back of the bag. This prevents your laptop from hitting the floor hard when you put your bag down. It’s also got a padded tablet sleeve, for non-laptop digital case reading or watching YouTube videos on break. Aside from a large main compartment for your big books, it has a well-organized front pocket section that keeps all your little stuff accessible. Osprey’s best in class warranty guarantee. They will repair ANY of their backpacks when they have a problem, or replace it if the bag can’t be fixed. You can’t find a better guarantee in the business. This bag will last you through law school and beyond (when you’re “begpacking” through Thailand after graduating in a down market, for instance). And as far as style goes, I really dig the “armor gray” color scheme pictured above. This bag comes in a number of different colors, though, to suit your needs. Check out this great backpack on Amazon to get the latest price. If carrying a ton of books isn’t a concern, and you find yourself heading to an internship at a more professional office, a briefcase is the perfect choice. I’ve selected two briefcases, depending on your budget. For those with some money to spend in the pursuit of quality, check out this full grain leather briefcase from Jackson Wayne. If you’ve read my post on leather messenger bags, you’ll see that full grain is as good as it gets. Maybe you should hit your parents or spouse up for an early graduation present? It’s got a rugged, classic style, without adding too many details like buckles and straps. A perfectly balanced look, if you ask me. If someone like Atticus Finch is your idol, you can’t go wrong with an old school bag like this. See what others are saying, and check out the latest price on Amazon here. 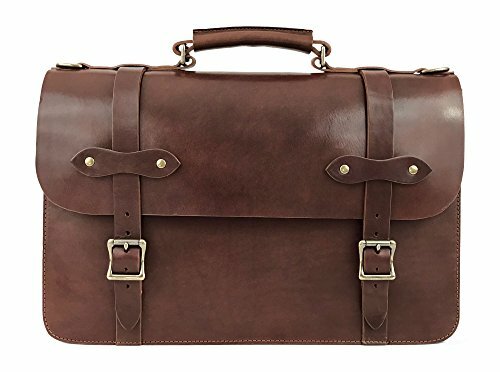 For someone with a smaller budget, there’s the Polare full grain leather briefcase. This is another great choice, made for heavy duty legal work. While you won’t fit a ton of books in here, it’s got the space for a laptop up to 16” along with one case book, I’d say. There’s also a few internal organization pockets and a second pocket that could fit your papers and tablet. 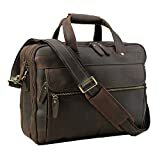 You can check out the best price for this excellent briefcase on Amazon. Need a bigger size? Polare’s got a 17” version, as well. Last, but not least, we’ve come to the law school messenger bag. Love them or hate them, they are an increasingly common form factor due to their portability. Particularly on public transportation, where you can keep all your stuff close at hand without having to take the bag off or keep it on the floor. I’m talking to you, backpacks and roller bags. They’re a mess when you’re on a crowded train or bus. 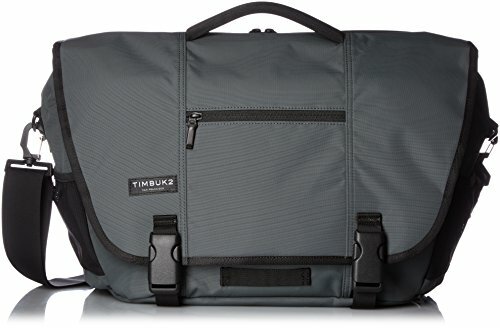 Anyway, my top choice for one of the best bags for law school is the Timbuk2 Commute Messenger. 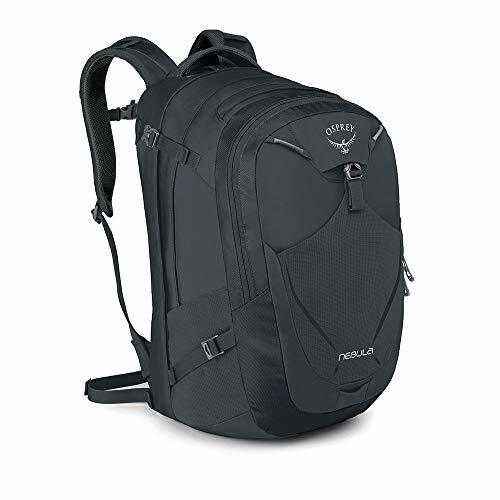 I love the style of this bag, and it comes from one of the most trusted brands for messenger bags, Timbuk2. There are 3 sizes, depending on how big your laptop is. Each will fit a little bit more, book-wise, too. If you’re carrying a lot of them, though, you may want to go back up to the backpacks I recommended earlier. It’s also got 14 interior and exterior pockets to organize your stuff, so there’s no worries there. The strap is padded and adjustable to help relieve any stress on your body from the weight you’re carrying. The Commute messenger comes in 6 different color options and 3 different sizes. Check it out and grab one for yourself on Amazon. A rolling bag for law school may not be the coolest thing you can use. But it sure is functional. I’d recommend this type of bag for those who are going to carry a ton of stuff, or have to move from school to office often. 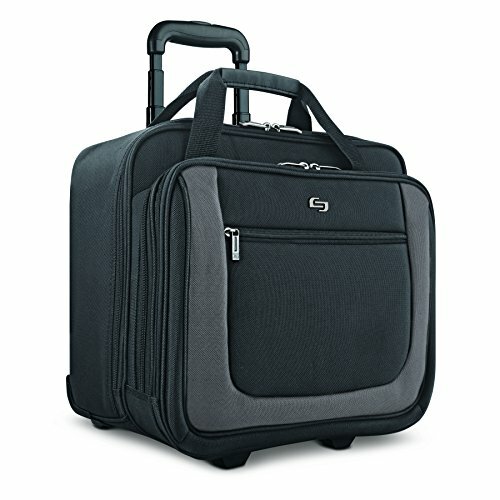 This bag, the Bryant Rolling Case from Solo, is like a mobile office on its own. The biggest benefit of a rolling bag is, of course, that it rolls. You save any strain on your back, while allowing yourself to carry more than you usually can in a backpack. The difference between this bag from Solo versus just grabbing any old carry on bag, is that it was meant for organizing your stuff. There’s a super useful front pocket section, with a number of smaller pockets for your phone and other stuff. There’s also a special file compartment to keep your important papers filed away and easy to access. Couple that with the giant main section for holding your books, and you have everything you need for school rolling along with you. Even better, this section will hold up to a 17.3” laptop, for those with the big computers. Best of all, it’s got a 5-year guarantee that’ll get you all the way through law school and bar study (those BarBri books ain’t light…). Read more reviews from actual owners here, or check out the best price for this bag on Amazon here. While not a super popular choice, the tote bag is a form factor I can get behind. It’s a bit more freeing than a backpack or a rolling bag, and keeps your back sweat-free. However, if you’re carrying a lot of stuff, a tote bag probably isn’t the best choice. 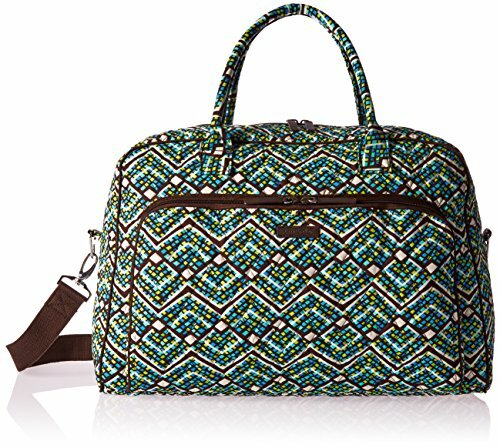 The Women’s Weekender from Vera Bradley is the best tote bag for law school, in my opinion. It’s got a good amount of space to carry a few books, your laptop, and other essentials. It’s not for the fussy or over-organized law student, though. Tote bags are more for the “throw it all in and I’ll find it when I need it” type. The best thing about the Vera Bradley is the amazing amount of colors and patterns it comes in, so there will be a perfect choice in there for everyone. You can see the vast selection of styles and the best prices on Amazon here. That being said, and as the name of the product points out, it’s mostly a bag for women. Or those who want to show their law school a little more pizzazz. For men and those looking for a more subdued law school tote solution, check out the Herschel Supply Co. Market Tote. It’s got a more unisex look, with a lot of style variety. There’s a pocket inside that can fit a laptop, but it doesn’t seem to be padded. Again, this is more of a casual bag for those who aren’t particularly concerned with organization or keeping things secure. That being said, both of these tote bags double as excellent weekend bags for trips home, even when flying. What features should you look for in a law school backpack? You’ll probably cower in fear. I know I did, the first time a professor calls on you in class. However, you’ve got nothing to fear in choosing a bag to hold your stuff. When selecting a bag for law school, there are 3 main features I’m looking for. These are all law school essentials when picking a backpack or other bag that’s going to last you through 3 years of lugging huge casebooks around. That’s assuming you’ll still have real books in 3 years. When looking for something that needs to last you a long time, you shouldn’t be shelling out for a fly-by-night brand of backpack. Quality items are something that’s worth spending a little money on, in my opinion. Whether it’s their reputation for great craftsmanship, a long warranty period, or just their awesome customer service – brands that have it all are worth sticking to. Obviously, if you’re going to use a backpack or other bag to carry your law school supplies, it needs to be big enough. 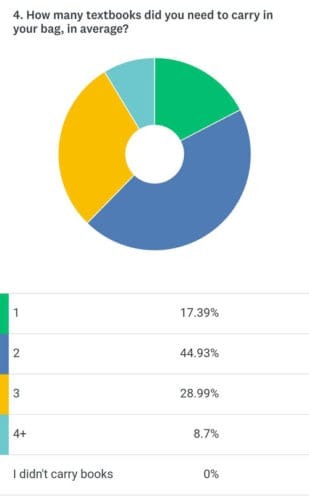 I’ll get to it a little later, but the results of my survey revealed that most law students are lugging around 2 casebooks at any given time. There were some outliers, but 2 was the most popular answer. These books aren’t small, either, so the main compartment of the bag needs to be large enough to accommodate them. All that stuff demands a bag with some room and organizational capabilities. A bag’s gotta be comfortable to carry around. Especially if you’re commuting to school on public transportation, you’ll want something that’s not going to destroy your back after a few years. Whether it is strap padding, a back support, or weight balancing, there’s lots of amazing things they’re doing with backpacks these days. What kind of bags do law students use? This is the ultimate question. Then there’s some people who just carry their books in their arms, but we won’t talk about them. Which one is the right one for law school, though? Just for y’all, I put in the work. To answer this age-old question, I turned to some crowdsourcing. I sent a survey out to dozens of law students, to find out what was happening on the ground these days. Through the info I gathered, I got a pretty good idea of what kind of bags they are or were using. What kind of bag did you use? What brand did you carry? How many books did you usually have to carry? Their answers were extremely informative, and I based the recommendations in this post on the responses. Question 1 – What kind of bag did you use? 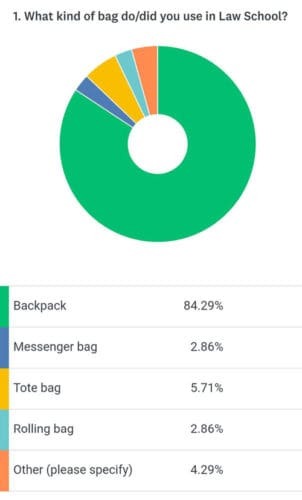 As you can see, backpacks were the overwhelming favorite. Just a few of each of the other types of bags were represented. However, I wonder how much this is coming from the social conditioning of previous schooling. I mean, a roller bag is actually more functional and useful for lugging law school books than a backpack. Then again, it makes you look like a huge nerd (just an opinion). Thinking back, though, a girl in my section had one. But no one really seemed to care about the aesthetics. Ain’t nobody got time for that when they’re trying to get the reading done. Question 2 – What brand did you use? The North Face was the clear winner, so you’ll see that reflected in my recommendations below. Question 3 – Were you happy with your choice? As for satisfaction with their selection, most seemed to be either satisfied or they didn’t really care. Some responses were emphatic about their North Face love, further solidifying that as a top choice. Question 4 – How many books did you carry, on average? Lastly, there’s the number of books. I wanted this info so I could gauge the best size for a backpack that the average student would find useful. If you’re not the average student, adjust accordingly. Most backpack brands have different sizes (20, 30, and 40L) in the same style. Osprey is particularly good with this range of options. Most law schools will have a set of lockers available, and schedules generally allow for you to visit them between classes. The only issue is going home with all your books, particularly those without a car commute. But as textbooks become increasingly electronic and cases and case notes are online, having to bring EVERYTHING home each night seems like a thing of the past. Don’t be like me – actually DO all your reading. Which form factor and bag are the best for law school? In this post, we looked at the different styles of bags, but in my survey and in my real life experience, there’s a clear winner for most law students. And the king among kings is the Borealis from The North Face (though the Osprey Nebula pack we looked at is an extremely close second!). It’s got everything you need to get through 3 years of law school, while saving your back from any pain and keeping you prepared for class each time. A bag is the last thing you want to be stressing about in law school – so most students should go with the tried and true. If you’ve got an alternative suggestion, leave it in the comments below. If you found your way here looking for non-law school backpacks for grad school, I’ve got just the post for you here. I’ll leave you with a little law school fun – a classic scene from The Paper Chase. For new law students, it will be either very comforting or extremely frightening that not much has changed since that movie was made. What’s the best backpack for carrying skis and snowboards?